Founded in 2003, Alumot is a network of individual Jewish environmental educators, the Teva Learning Center and Gan Chaim who all share an interest in incorporating gardening into their work. With a grant from CAJE, the Coalition for the Advancement of Jewish Education, the members of Alumot embarked on a multi-faceted project; to create a resource manual for Jewish educators and to start a pilot garden program. The pilot garden was established in the spring of 2004 at the Robert Saligman Middle School in Melrose Park, PA. The garden consists of two main areas: a world peace flower garden and a larger vegetable and herb garden. Over the spring of 2004 we worked with the Saligman students on all aspects of the garden: seed saving, design, starting seeds indoors, and the physical construction and planting of the garden itself. We have also worked with other organizations on site such as ACAJE, The Auerbach Central Agency for Jewish Education, and the Jewish Community High School of Gratz College to create a true Jewish community garden. 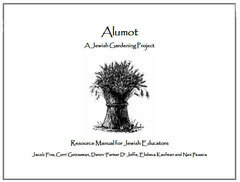 Completed and published in August of 2004, the Alumot Resource Manual for Jewish Educators is a valuable tool for people looking to integrate gardening into their teachings. The manual follows the progression of starting and maintaining a garden program and places each stage in a Jewish framework by connecting it to texts, holidays and rituals. It is full of numerous activities for gardeners young and old and also includes a full resource section, suggested themes for Jewish gardens and contact information for various Jewish gardening projects around the country. The manual is available for purchase through our online store. For more information contact us at info@jewishfarmschool.org or 215-609-4680.